In search of weekend inspiration? Look no further! There’s lots of fun stuff going on in Brighton this weekend, including the community-run Brunswick Festival, a craft and vintage fair, and lots of live music! 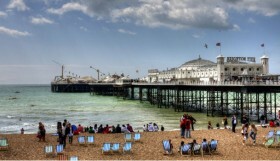 If the sun decides to show it’s face, have a laze on the beach or chill out in one of Brighton’s best beer gardens. Enjoy! 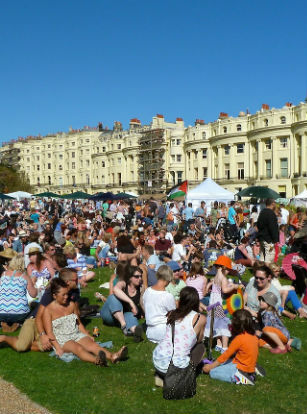 Brunswick Square Festival 2015 – A fun filled family weekend with a full programme of live music, dance, circus skills, healing area, children’s activities, arts and crafts. Expect a bustling market area with bric-a-brac, home made goods, vintage clothes, charity information stands and other wonderful stalls galore. 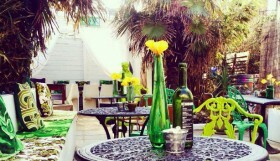 The ‘Brunswick Tavern’ tent will be serving up real ale, cider, wine, beer and Pimms. Don’t miss this community-run celebration! Lost and Found – Lost & Found is a powerful and challenging multi-media installation of visual arts created to present evidence of the links between consumer culture and the decline of the natural world. It focuses on over production and over consumption, particularly of food, and the impact this is having on the British countryside. This must-see exhibition can be found at ONCA gallery all weekend. Shakedown Festival – On Saturday 15th August 2015, Shakedown returns! Formerly in Stanmer Park, the festival has moved to Waterhall and has four stages hosted by Defected, Hospitality Cirque Du Soul and Supercharged. Expect big things, and if you aren’t ready for the party to end, head into town afterwards for one of the Shakedown after-parties. 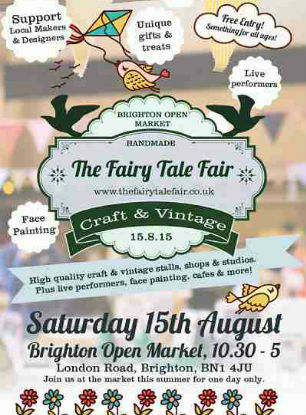 The Fairytale Craft and Vintage Fair – On Saturday 15th August The Fairy Tale Fair will inspire shoppers with 20 carefully chosen, high quality, handmade / hand designed stalls by local designer and makers. This is a real community event, browse jewellery, prints, cards, knitted items, felted items, chocolates, decorations, children’s items, baby clothes, art and vintage accessories. Plus face painting and live performers! Lout presents: Brighton Rocks – Lout Promotions presents Brighton Rocks, a showcase of some of the best local bands at Sticky Mike’s. Featuring garage rockers Cardboard Hit, Daddy’s Girl, Bad Girls and HotMoth. This is the place to be if you like to be at the forefront of the local music scene! Talking Heads – Alan Bennett sealed his reputation as the master of observation and brilliant comic phrasing with this series of ground breaking monologues, originally filmed for television. This is a rare opportunity to see three of the original Talking Heads, at once darkly comic, poignant and uplifting and widely regarded as modern classics. 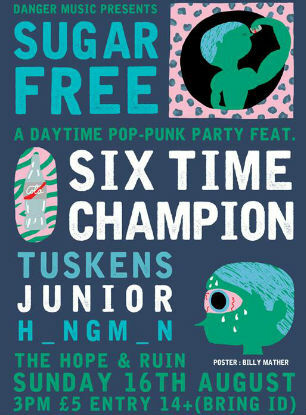 Danger Music Presents: SUGAR-FREE – Sugar-Free is a new daytime pop-punk party for 14+, Danger Music bringing some of the most exciting pop punk & emo bands from around the UK. The launch show features Six Time Champion who have been making waves in the pop-punk scene, and after various tours of the country they hit their home town for what promises to be a fun packed energy filled show. Support comes from Tuskens from Bristol, Junior from South Wales & local emo duo H_ngm_n. Rainy Day Bear’s Adventure – An exciting show for children aged 2-6 – a fun, interactive journey with songs and dancing. The story follows a girl called Milly and her adventures with her favourite toy, ‘Rainy Day Bear’. Together, they visit the ‘Jelly Bean Jungle’, the ‘Sea of the Seven Stripy Saucers’ and the ‘Curly Coloured Cake Castle’. Each magical place has its own challenges to be faced and is designed to stimulate the imagination. Join in with the children’s songs, bring a picnic and a blanket and enjoy! Children’s Play Day at Brighton Toy and Model Museum – On Sunday 16th of August, Brighton Toy and Model Museum are hosting their first Playday of 2015, and, in honour of NASA taking those amazing pictures of Pluto, this event will be themed on Space Exploration and Science Fiction. 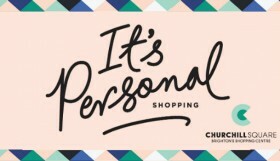 Expect papercrafts, art, stories, play and most importantly fun! All based around rockets and aliens, astronauts and space stations. Aimed at Children from age 3 up to 12. The Balvenie Outdoor Film Screening Celebrating Craftsmanship – The Balvenie single malt whisky are hosting an outdoor film screening with a complimentary BBQ and whisky samples, at Brighton College. Two short films will be screened both celebrating the brilliant world of craftsmanship. The first film is the Intelligent Hand, a documentary about craftsmen around the world and their dedication to their work. The second is the making of The Balvenie Morgan, giving a unique insight into life at the factory. Morgan car owners will be travelling from London to Brighton in convoy to enjoy and will watch these wonderful films from their cars. If you do not own a Morgan car you are still more than welcome to attend and watch the films, however please make sure you bring your own picnic blanket! 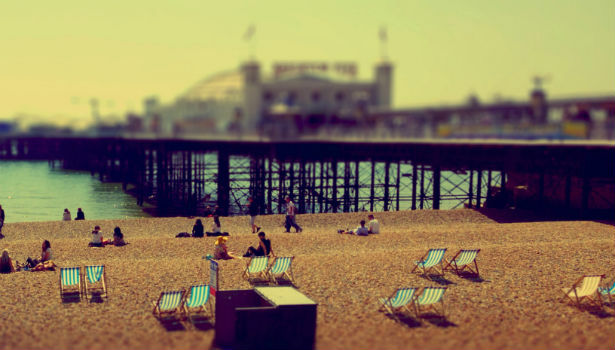 Want the best stuff from We Love Brighton every week in your inbox? Brighton & Hove Radio Cabs - Your A to B Experts!